Embedding flexible working across an organisation means rethinking traditional methods of management. Joanne Molesky, principal consultant in IT governance at ThoughtWorks, says lean principles can drive innovation and culture change – which is good for employees and the bottom line. Companies live and die on their ability to be flexible, and quickly adapt to market changes to create ongoing value for customers. Over the past five years, rapid changes in technology and increased use of mobile devices in business have fueled competitive pressure on organisations. The long-term survival of any company depends on its ability to understand and harness the cultural and technical forces that drive the innovation cycle. The deeply embedded traditional models we have used to manage organisations and IT are rigid and unsuitable for rapid innovation cycles, slowing the entire business. Introducing flexibility into the way people use technology to produce technical based products and services is essential for improving value delivery. To do this, we need to change the way we think about how we manage the workforce. As the pace of social and technological change accelerates, the ‘lean approach’ becomes increasingly relevant to the world of technology; it provides a strategy for thriving in times of uncertainty by embracing and dealing with change in a positive manner. The key to creating a lean enterprise is to enable the people doing the work to solve problems in a way that is aligned with the strategy of the wider organisation. This is a huge cultural shift for many organisations, which could take many years. So where do you start in your journey? Many large organisations operate by ‘command and control’. The people at the top make the plans, which in turn get executed by the people at the bottom of the hierarchy. Communication and reporting is rolled down and up through many layers, which in turn triggers the people at the top to issue the next set of plans and targets for everyone. The biggest drawback of command and control is that it takes too long for the people at the top to get complete and accurate information on what’s actually happening, on which they must base decisions on what the next set of actions should be. In addition, those executing the work don’t feel empowered to make or suggest changes, potentially leading to less productive teams. ‘Mission command’ is a concept that can be used to create alignment of teams at scale across large organisations. Senior organisational leaders need to be clear about the end goal, the purpose and the easiest path to success. The key to making this work is to enable autonomy by setting out clear, high-level target conditions with an agreed time frame. By leaving the details of how to achieve the conditions to the team, staff are empowered and encouraged to be accountable. A great deal of effort is put into most change initiatives; knowledge is gained and some teams will put new practices into play that help improve performance in isolated areas of the company or for short periods of time. However, if there is no culture shift driven by changed behaviors within senior management, and expectations for continuous ongoing improvement are not made clear, the performance drops back to previous levels over time. Lean thinking focuses on maximising customer value while reducing waste and focusing on the end-to-end value stream of a product – from initial concept to the customer. The focus must be on improving the horizontal flow of the product across departments and technical services. The basic principles and tools can be applied to any area of an organization: manufacturing floors, technical systems and internal processes such as finance and program management. An experimental mindset is critical for making lean work. Organisations cannot shift their culture over night, and a ‘learn fast/fail fast’ attitude means you can test more ideas and spread risk across more ideas. When a hypothesis is proven to be invalid, it is not a failure of the experiment or the people who completed it. Failure only happens when you don’t learn from it or, even worse, use the results as an excuse to stop trying anything new. Continue to review and update your metrics and value stream mapping to allow you to measure improvements in flow as you make changes in the way teams work together. A case study in the UK that is a great example of an experimental mindset is GOV.UK Digital Services. GOV.UK is the single domain for all central government services. It was launched in October 2012 and today has replaced thousands of websites with a single service that is simpler, faster and easier for UK citizens to use. 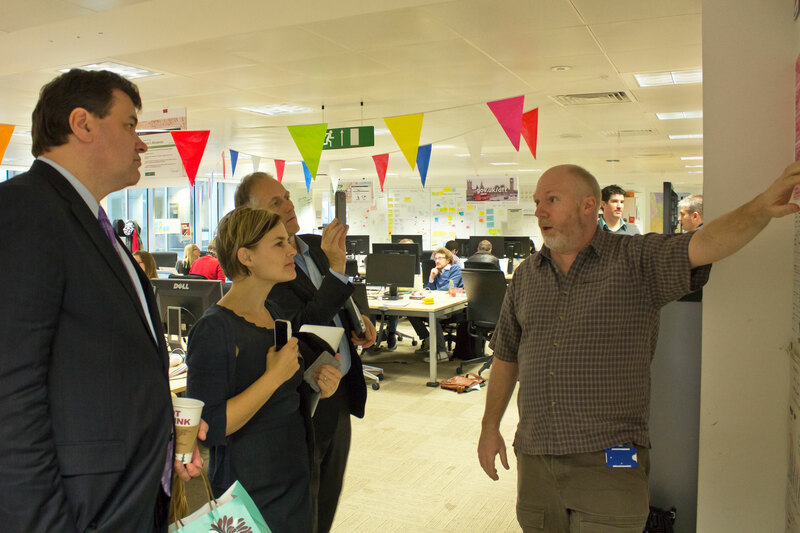 One aspect of GOV.UK that sets it apart from a typical government project is that it is developed almost completely in-house by civil servants working for the Government Digital Service (GDS), part of the Cabinet Office. It was and continues to be built iteratively, and relatively cheaply, using lean principles, agile methods and technologies more commonly associated with startups than large organisations. Teams that have built the site are accountable for maintaining it and constantly improving the services offered there, empowering them through ownership of their work. By implementing ‘mission control’, the management established a clear focus for GOV.UK (improved user services) and got rid of many old–school control processes to allow teams to work faster and better. They established guiding principles for teams to make decisions about how they designed services, boundaries in the form of standards and provided complete transparency to all stakeholders into how they work and the results. The initial phase of transforming government digital services has been very successful, significantly reducing costs while building services that end users want to use. In March 2015, Digital Services announced its next target: Government as a Platform. The approach will again be experimental, starting small and building out, just as they did in the first phase. Start by Understanding the direction we want to go as it is described by our organisation’s leadership. We must work towards this vision. We will experience some obstacles that we need to overcome, but as long as we see them as opportunities for experimentation and improvement and not objections to change, we should be all right. Next, grasp the current situation and establish a target condition. Techniques such as “go and see”, value stream mapping, and gathering metrics on current outcomes and conditions help us with this phase. Once we know where we are at today, we can establish our own improvement targets for the future. Where do we want to be one, three and six months from today? How about this time next year? Recognise that your situation will change as you move towards your target condition, experimenting and using collected data to measure progress along the way. 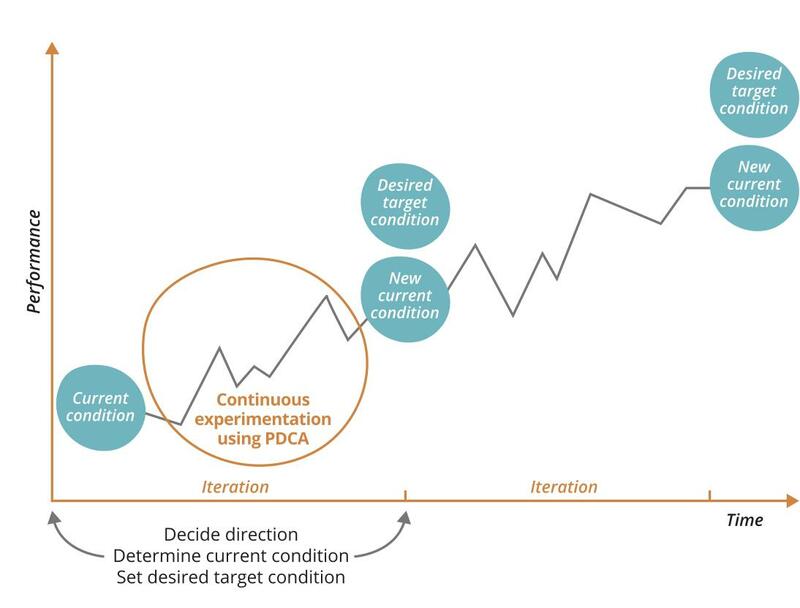 Evaluate and adjust activities over time to continue to the target state, which is likely to change over time as well. At some point, you may decide to pivot or discontinue certain products and services, learning that your original targets for these were wrong or unrealistic. The biggest barrier to success in changing the way you work is a conviction that your organisation is too big or bureaucratic to change, or that your special context prevents adopting lean principles and practices and an experimental approach to change. The only guarantee is that if you fail to attempt to experiment by losing command and control and allow people to align their work to customers and your organisation’s goals and objectives, a more certain, negative ending is in your future. Joanne Molesky is co-author of Lean Enterprise: How High Performance Organizations Innovate at Scale. Loved this article as well. We’d love to tell you our thoughts about Size Zero – and the 10 fundamental pillars of businesses shaping up for a new economy to work smarter, more efficiently etc. Thanks Katy. We have spoken to Philip Letts at Blur about Size Zero : https://flexibleboss.com/2015/03/30/size-zero-business-campaign-launched/ and are keen to hear how the campaign progresses. Thanks for this post: a good distillation of lean principles many of get wrong! I was surprised not to see a citation for Lean Enterprise by Joanne, Jez, and Barry. I think readers who like this post would love to follow up in more detail with the source. We’ll add it to the text as well.